I know the idea of drinking carrots sounds like it would be part of some sort of major juice fast or something incredibly healthy that warrants wincing...but bear with me. I can see the look of doubt in your face as I type this, but this twist on a classic mimosa is really good and it's sooo perfect for Easter morning/brunch. I'm in love. Instead of pure carrot juice, I opted for an organic carrot/orange blend that's got a tiny bit of sweetness to it and it's really yummy. 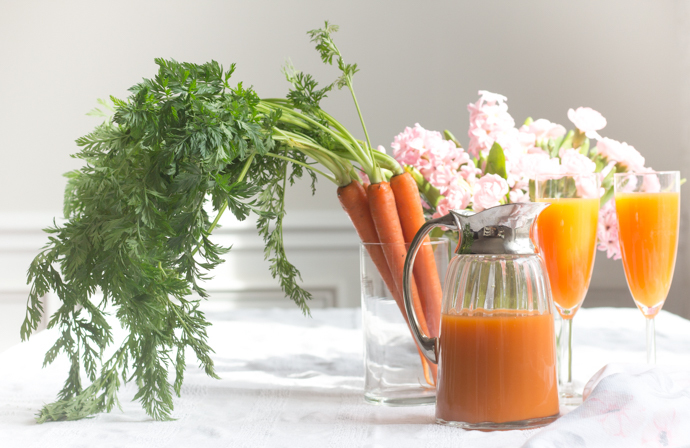 I used one part juice to one part prosecco and then added fresh carrot leaves for a darling little addition and I love how they turned out! 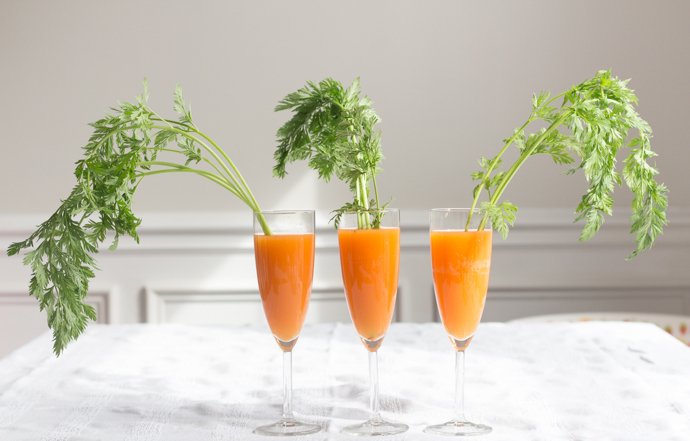 They are really delicious and a fun alternative to a traditional mimosa or even a bellini. (Though adding a bit of peach juice or mango juice to this would be amazing too!) Best of all they are so easy and require little prep work to make a big statement. 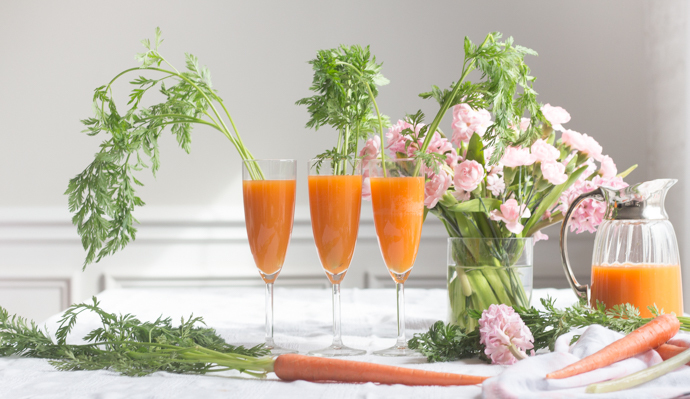 I love how they look like giant carrots in the champagne flutes. Olivia got such a kick out of them, too! I think they are so cute! They would be a really sweet addition to your Easter morning tablescape- imagine one of these at each seat; instant decor! Of course if your kids are jealous of your cocktail you can serve them theirs sans bubbly and let them use a champagne flute (even better if it's plastic!) so they can enjoy a fun Easter drink too. You could also add sparkling water if they like bubbles and it's even cute in one of their own water bottles without the lid as you can see below. We will definitely be cheersing with these delicious cuties on Sunday! I hope you love them as much as we do!